The most efficient and reliable satellite phone in the world. 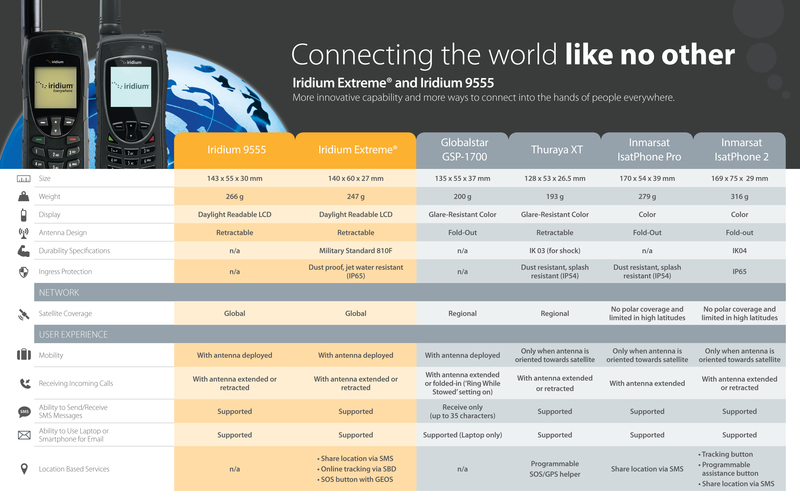 Product ready to go, and fast delivery.Iridium Extreme 9575 satellite phone is currently the world's toughest and most reliable satellite phone that operates on the world's only truly global satellite communications network, keeping you connected anywhere in the world including oceans and poles. The new Extreme 9575 comes packed with the most features and durability that has ever been engineered into a satellite phone. It is the only satellite phone with GPS-enabled SOS and tracking ability and can connect with devices such as the Iridium Axcess Point to create instant Wi-Fi hotspots from any location on the globe. The GPS online tracking and an emergency SOS button service will alert your programmed contact of your location and will create a two way connection to assist with the call. The Iridium Extreme is built to military grade (MIL-STD-810F) durability making it the most rugged handheld phone manufactured to this date. It is the first satellite phone with an Ingress Protection rating of IP65. It is shock resistant, dust proof, and jet-water resistant. Highly recommended for emergency crews, paramedics, military personnel and government operations. Iridium 9575 Extreme is also perfect for those just needing emergency communications. No matter what industry you are in or how you plan to use it, the Iridium Extreme holds up to its name by giving every user the freedom to roam and the power of connecting under the harshest conditions, anywhere on the planet. Check out the New INNOVATIVE Iridium GO! Satellite Wifi Hotpsot, this device turns your smartphone or tablet into a portable satellite phone, with rich features such as email, SMS, tracking, SOS, weather reports, social media updating, and much more. Iridium network is a system of 66 LEO (Low Earth Orbiting) active satellites covering the entire earth’s surface moving from pole to pole used for worldwide voice and data communication from hand-held satellite phones and other transceiver units. The Iridium network covers the whole Earth, including poles, oceans and airways. There are many coverage maps depicting the iridium satellite network, but ultimately the iridium network is the only completely true global network available. The design of the Iridium network allows voice and data messages to be routed anywhere in the world. Voice and data calls are relayed from one satellite to another until they reach the satellite above the Iridium handset or terminal and the signal is relayed back to Earth. When an Iridium customer places a call from a handset or terminal, it connects to whatever satellite happens to be overhead, and is relayed among satellites around the globe to whatever satellite is above the appropriate Earth gateway, which downlinks the call and transfers it to the global public voice network or Internet so that it reaches the recipient. Como usar el teléfono satelital Iridium 9575 Extreme en tu vehículo. Dec 2014 - We searched a year ago for a satellite phone for offshore sailing passage making to stay in touch, to communicate with our meteorologist and in worst case scenario to be able to talk to the Coast Guard. We decided to go with the best phone even if the cost was a bit more because when you need it you need to have faith that it will be their for you. We keep it in a secure case with solar charger and it can go in any rescue life raft with us. We keep it on the whole time off shore. Northern Axcess had the best plan of a good handful of options and in addition they have been very personable and helpful. Click the button below to add the Iridium 9575 Extreme Satellite Phone - CPKT1101 to your wish list.